It's from a sarcophagus from Jewish catacombs in Rome. As explained You are not allowed to view links. Register or Login to view., the imagery is fairly standard pagan four seasons stuff. But the object within the circle is unusual. Generally a portrait of de deceased would be carved here, but this sarcophagus was ordered by a Jew who opted for a menorah instead. The menorah, as it was drawn here, reminded me immediately of a specific Voynich plant: You are not allowed to view links. Register or Login to view. But there's more. The menorah in this picture and others has been carved to make it look like it's made from a series of beads or other interlocking sections. A similar type of decoration might be alluded to in the lower part of the roots. You know, I did think once or twice that the shape of the plant was quite stylized but I never specifically thought menorah because so many herbal drawings are stylized (and have a flattened look). 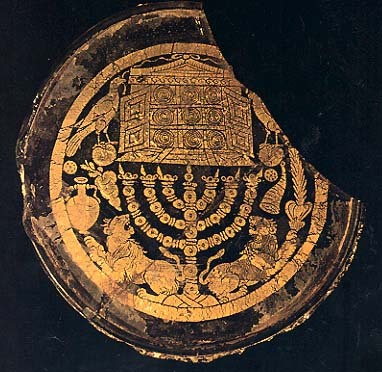 But the way the roots are drawn does look referential, so perhaps it is a menorah. Petals: If the amber part is separate, there are 14, if they are attached to the semicircle on top, there are 10. I can't tell if the blue on the right is a shadow or a petal. It's possible there are four flowers and the number of petals is less important. Legs - 9... I think. Two have hatching but it seems to be for shading, not a separate "root". The shape of it reminds me of a round temple with arches. Not necessarily menorah, but I think that candelabrum in general is a good parallel. "Leuchte" in Pritzel yields Euphrasia officinalis... don't know. Another possibility is a reference to a tree of life. In Indian tradition, the base is often overlaid on a scaly hill texture. In Celtic tradition, an intricate lacework of roots (which is more similar to the VMS). In Hebrew texts, it is often represented schematically. Egyptian and Assyrian don't usuallly show the roots. The Norse Yggdrasill is the tree of the world, with the branches and each root extending into a different realm. The numbers 3 and 9 are strongly associated with the myths, as is water (and wells). The number of arms matches perfectly with the menorah, but in all but a few cases a menorah's candles are one one horizontal line. So it may well be a more general candelabra. Trees of life from all kinds of cultures do look like a number of Voynich plants, because of the central "pillar" with symmetrical side branches. I think they are meant to be 3D. This somewhat hesitant hatching is used in several of sections of the VMS for things that look like they are meant to be 3D-ish. The illustrator isn't very good at it. 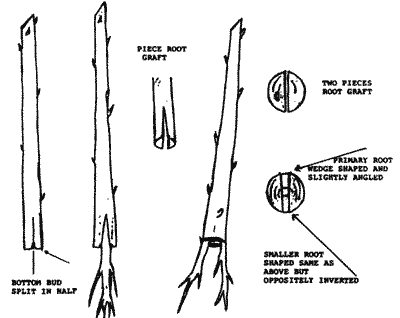 It seems to imply that the arrangements of the roots is not flat, but rounded (imagine roots growing around a stone and then taking the stone out). When I first saw it, it reminded me of those small round roadside Pagan temples (the ones that often have a figure inside each arch). It was the Greco-Roman version of a roadside chapel where travelers could stop to give offerings and pray. If the top is a reference to a candelabra (menorah or otherwise) and if the roots are meant to be temple-like, then there would be a certain thematic consistency and one would wonder if the plant mnemonically represents an herb used in offerings or on certain holy days. Unfortunately, there were many of these—it could be challenging to narrow down. 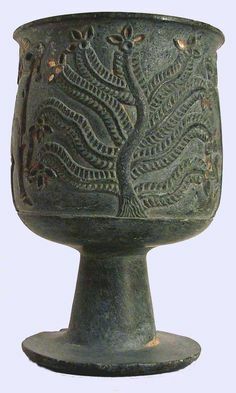 There are also oil-producing plants that were harvested for lamp oil (the menorah being a example of a candle-holder strongly associated with oil). Yes, there does seem to be some relugious theme going on here. The bottom part of the roots also look like beads or rings on a string, which were important in various cultures. Yes, the spikes certainly look very deliberate, considering two poke up into the unpainted "root", which is not something one sees in natural roots. If they curled around more, in a loop, they would somewhat resemble a crown of thorns. The segmented parts remind me of flails. The upright posture of the plant has always seemed rather human to me. Crucifixes were often illustrated in threes and the "plant" has three sets of arms. It's almost like a story is being told. If you'll humor me for suggesting something wildly speculative... menorah or tree of life at the top (Jewish, although many cultures have trees of life), Greco-Roman in the middle (Pagan temple), Christian at the bottom (crucifixion and flail references). If it's anything even vaguely in that ballpark then it's very philosophical and quite unusual. Hmm... well I'm sorry to bring down the discussion from such lofty heights, but to me this image seems to display elaborate root grafting techniques more than anything else. Crown of thorns was also the first thing I thought of, but this looks very different. fine, long, chaotically spaced spikes. So it seems to be quite far off. I wouldn't discount the possibility that the plant itself is spiked, though it would be weird to have them only on part of the roots.